The M 40 furniture from HEWI offers real design freedom: The modules form a flexible storage system, which really does fit in any bathroom – whether a design bathroom, a generously sized comfortable and convenient bathroom for the family, a small guest bathroom or an accessible bathroom. 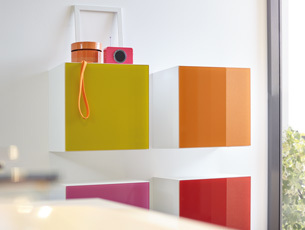 The high-quality modules with puristic design can be extended from a solitaire to a wall installation. The elements can be arranged however is required, as a shelf or single module. Thanks to the use of special hinges the modules can be seamlessly jointed together. The M 40 furniture conforms to the design principles of classic HEWI design: clear lines, striking colours, high-quality materials and enduring quality. 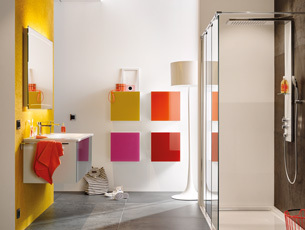 Eleven glass colours and two depths (15 and 30 cm) offer unlimited possibilities. 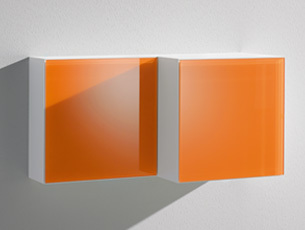 The HEWI furniture offers suitable modules for niches, small bathrooms or the generously sized spa.The basic modules (40 cm high) are complemented by variable cabinet modules in two depths (15 and 30 cm) and three heights (80 cm, 120 cm and 160 cm). Additional shelves create space and order in the bathroom. HEWI offers washbasins made of high-gloss white mineral composite to match the M 40 furniture. The washbasins can be wall mounted individually or combined with the matching base cabinets of the M 40 furniture. This creates storage space so that bathroom utensils can be clearly arranged in the drawer of the base cabinet. The HEWI mirror cabinets offer even more space. They have integrated LED lighting.